Sea surface temperatures (SSTs) are still above average across the equatorial Pacific (Fig. 1), but they have fallen since last month (Fig. 2). Atmospheric conditions still have not coupled with oceanic conditions, and the Madden Julian Oscillation (MJO) is being discussed as one source of this delayed interaction. Forecasters continue to expect an El Niño to form, provided atmospheric conditions catch up with oceanic conditions and that SSTs remain above normal, but the window for relevance of such an event to the Southwest (i.e. the effect on cool-season precipitation) is closing. On Jan. 8, the Australian Bureau of Meteorology remained in an El Niño alert, with the tropical Pacific Ocean in line with a weak El Niño but the atmosphere showing “no consistent El Niño signal,” a requisite part of sustaining an El Niño event. 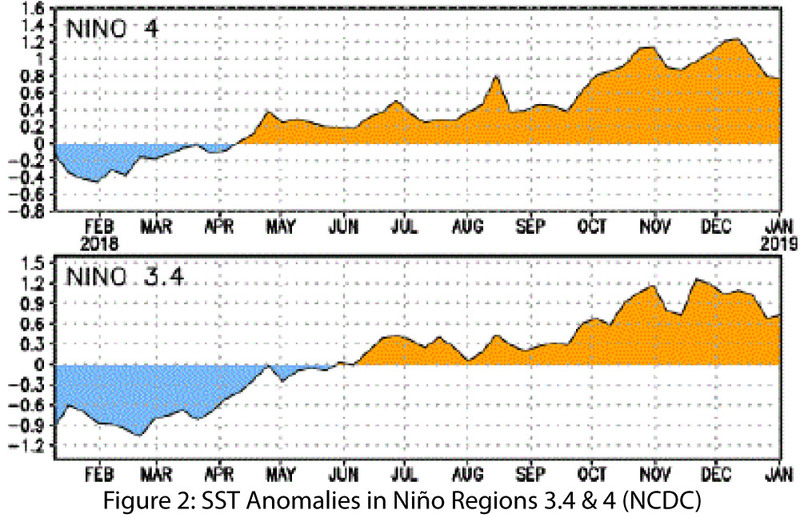 The agency noted that it is late in the season for El Niño formation. On Jan. 10, the International Research Institute (IRI) issued an ENSO Quick Look, highlighting above-average SSTs along with lagging atmospheric conditions. It maintained an 82-percent chance of an El Niño during January to March and a 66-percent chance from March to May (Fig. 3). On Jan. 10, the Japanese Meteorological Agency (JMA) maintained its assertion of the presence of El Niño conditions in the equatorial Pacific despite lack of atmospheric reinforcement, and called for an 80-percent chance of these conditions lasting through the spring. On Jan. 10, the NOAA Climate Prediction Center (CPC) continued its El Niño watch, but saw decreases in SST anomalies, noted the continued lack of atmospheric reinforcement of El Niño, and highlighted a possible link to the MJO. CPC’s outlook dropped to a 65-percent chance of an El Niño forming and lasting through spring. 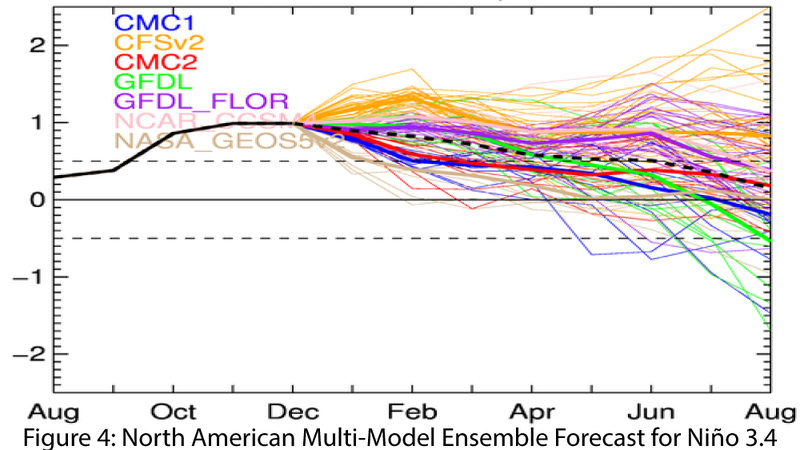 The North American Multi-Model Ensemble (NMME) points toward a weak El Niño at present lasting through the spring (Fig. 4). Summary: This year highlights the challenge of seasonal forecasting with unclear El Niño signals. Equatorial SSTs are within the range of a weak El Niño, but the delayed development of atmospheric conditions is the main factor holding back a more confident outlook. 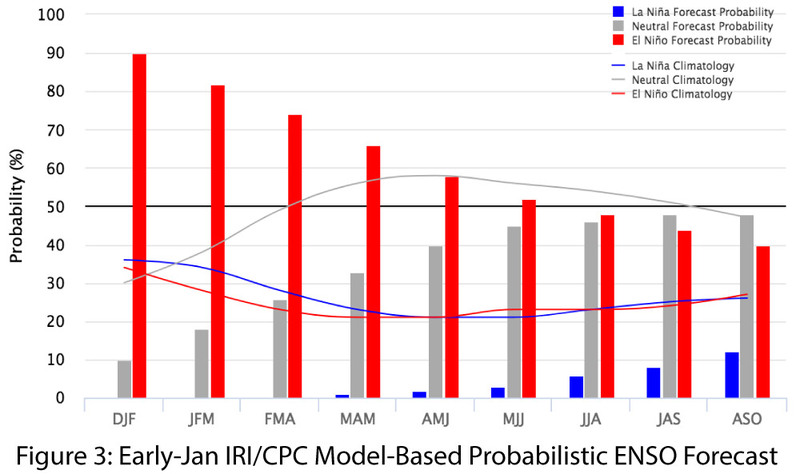 The presence of seasonal variability attributed to the MJO further complicates the contingencies and uncertainty attached to seasonal outlooks. In the Southwest, El Niño events are typically associated with increased chances for above-normal winter precipitation, but weak events demonstrate limited correlation with above-normal precipitation, and some of the wettest winters in the Southwest have been under ENSO-neutral conditions. This winter, portions of Arizona and New Mexico have recorded wetter- and cooler-than-average conditions for much of December and January thus far, which lines up with the narrative of wetter winters under El Niño. However, direct attribution to El Niño is challenging given the small sample size, aforementioned weak correlations, and the challenges in tracking precipitation anomalies in a region that already sees relatively infrequent rain events in a “wet” year.